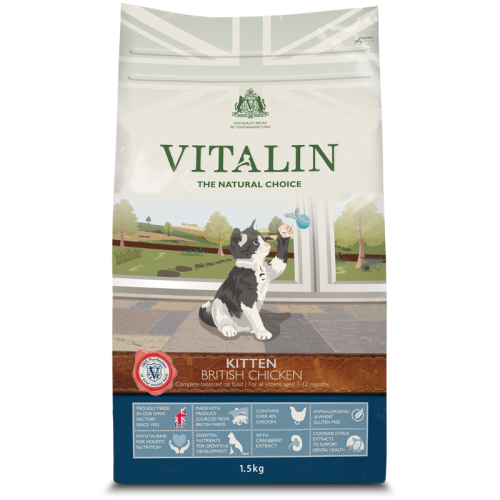 Vitalin Kitten has been specially formulated as a nutritionally complete and balanced recipe for Kittens to maximise growth and development. A hypoallergenic and wheat gluten free food that contains a high quality protein from 100% British Chicken. •	Enhanced with pre-biotic FOS & MOs to support your cat’s digestive system. •	Contains cranberry extract to support the urinary tract. •	Contains over 40% chicken. Chicken Meat Meal (30.0%), Brown Rice, Chicken Oil, Fresh Chicken (10.0%), Pea Protein, Whole Egg Powder, Chicken Digest, Carrots, Salmon Oil, Citrus Extracts (0.2%), Fructo-oligosaccharides (Prebiotic FOS) (0.1%), Mannan-oligosaccharides (Prebiotic MOS) (0.1%), High Nucleotide Brewers Yeast (0.05%), Cranberry Extract (0.05%), Rosemary (0.05%), Extract of Yucca Schidigera (150 mg/kg).